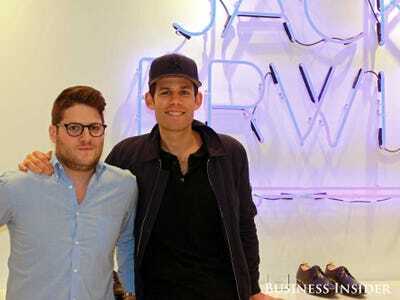 Madeline Stone / Business InsiderAriel Nelson (left) and Lane Gerson (right), cofounders of Jack Erwin. 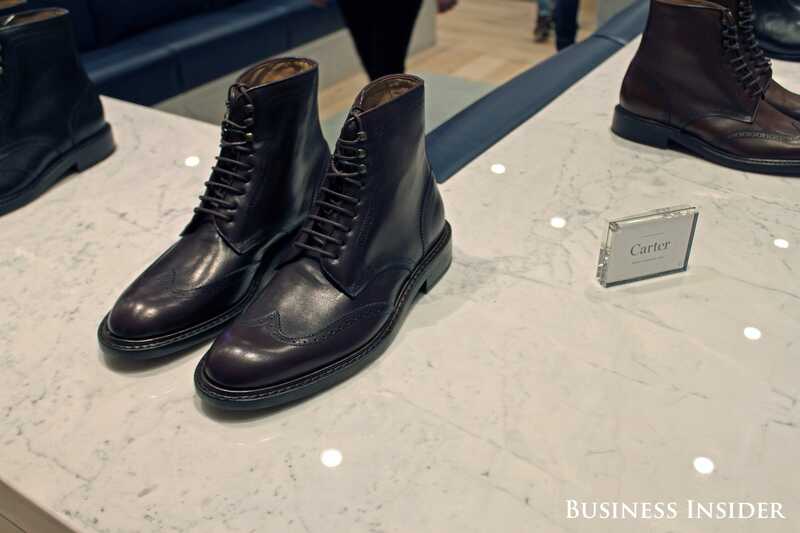 Lane Gerson and Ariel Nelson started their shoe company, Jack Erwin, when they saw how difficult it was to find a quality men’s dress shoe at a reasonable price point. 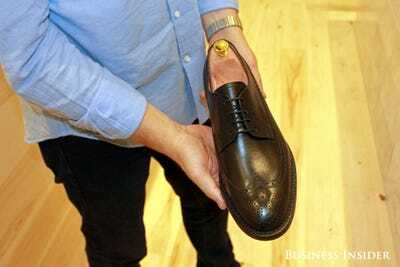 To solve the problem, Gerson and Nelson found a way to make a high-quality, classic shoe that won’t go out of style or break the bank. From a classic penny loafer to a wingtip oxford, the goal is to create staple shoes for less than $US100 each. 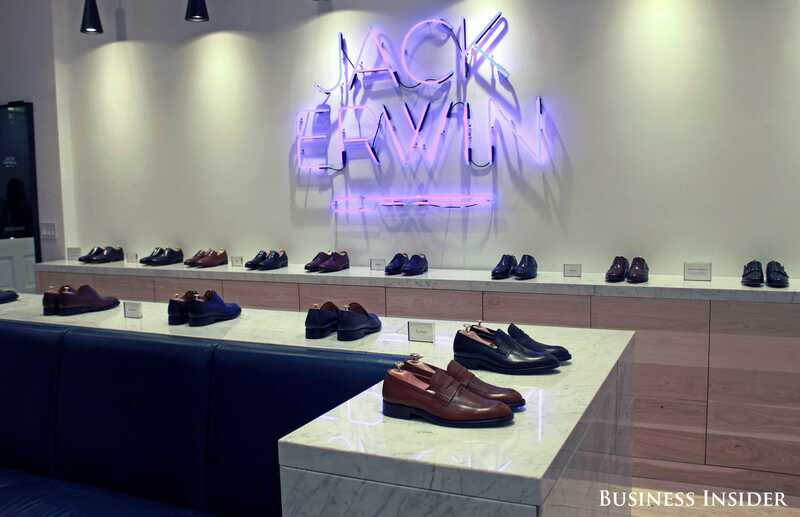 Jack Erwin shoes are manufactured in Spain with leather that comes from Italy and France. They sell 15 different styles in three collections, all priced between $US95 and $US220 and available for purchase online. Jack Erwin has caught the attention of some tech investors since opening for business in 2012 — in September, they closed a $US9-million Series B funding round led by Brown Shoe Company, with contributions by CrossLink Capital, Shasta Ventures, and FundersGuild. 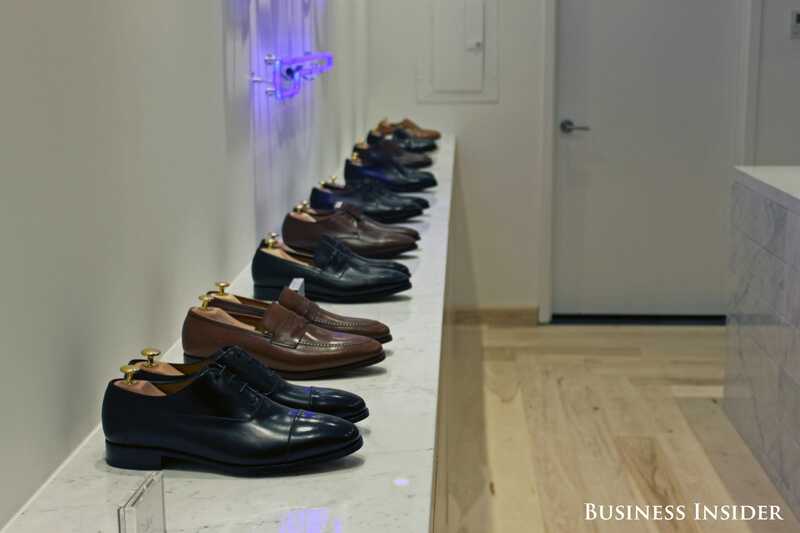 And now Gerson and Nelson are taking it a step further, opening a brick-and-mortar Fitting Room in New York City’s Tribeca neighbourhood. 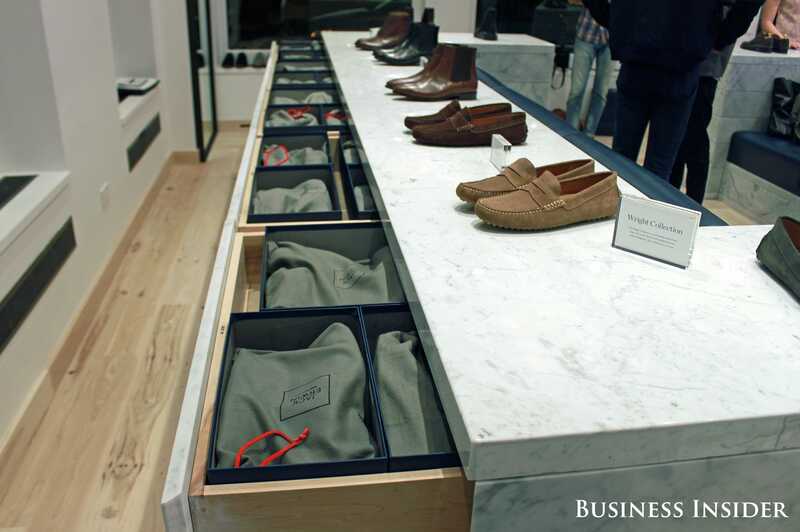 Customers can walk into the store, try on some of Jack Erwin’s styles, and then place an order to be delivered within a few days. At the Fitting Room, samples of each Jack Erwin style are lined up on counters. Customers are paired with a sales representative, who helps them pick out a style and size. They’re encouraged to take a seat on couches in the middle of the room. “We wanted it to be a real communal experience,” Gerson said. The Fitting Room doesn’t keep an inventory, instead only storing enough pairs for customers to try in each size. “We think people will actually like walking out of here without a bag,” Gerson said. Sizes are located in drawers below the display, though they’re disguised to look like marble. The representative takes care of the customer from start to finish, eventually placing orders on iPads and arranging for the shoes to be shipped to the customer’s home. The Fitting Room was completed in an extraordinarily short amount of time. The space was purchased just six weeks ago and was still a construction site five days before opening. 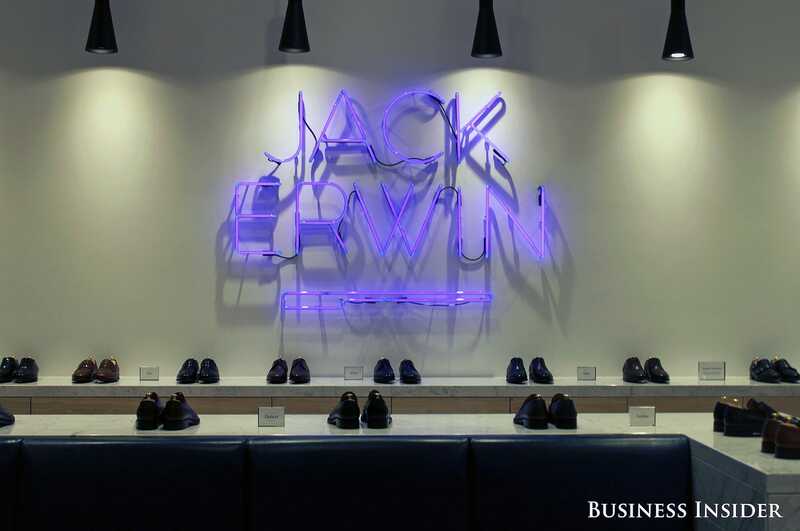 But this is an extremely dedicated team — Gerson and Nelson even live in Jack Erwin’s SoHo office, just a few blocks away from the new Fitting Room. Jack Erwin has always been about maintaining quality, and the Fitting Room is a good way for them to demonstrate that. “It’s all about showcasing the construction,” Nelson said. Nelson showed us some of the brand’s most popular styles. 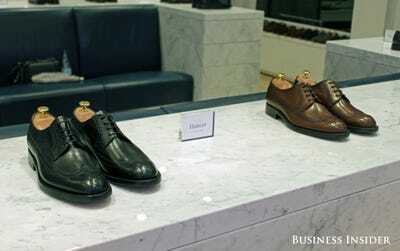 Black shoes tend to be more popular than brown, though he points out that many customers choose to buy both. Boots have also been popular as cold weather approaches. The Fitting Room officially opens Thursday, but curious neighbours have been peering into the windows and trying to come inside even days before the launch. “We’ll take that as a good sign,” Nelson said.